I've been playing poker for more years than I really want to think about. I've played in home games, casinos, poker rooms, parties, even hospital rooms. I've played in tournaments and cash games, live and online. So when my friend and fellow poker player Lou Krieger started pushing me to go to a poker convention called BARGE, I couldn't imagine that there was anything I'd experience there that was substantially different. Lou started cajoling me about going to BARGE back in 1997, when we were both playing regularly in limit hold 'em games at Hollywood Park. I had several friends that went every year. I finally got a little taste of what I might be missing when I attended ESCARGOT, a smaller version of BARGE held at Crystal Park in 1999. It consisted of about 60 people, all rabid poker players, who were there for one reason: to have fun playing poker. From 1997 to 1999, I made a substantial part of my living playing poker. One of the unfortunate side effects of playing poker for a living is that the game loses most of its fun aspects - it's a living, not a game. ESCARGOT reminded me that poker can, in fact, be a lot of fun. But it was three more years before I attended BARGE and finally got what all the fuss was about. I had started working for PokerStars in early 2002, and during the summer a friend mentioned that there was an opportunity to sponsor BARGE. BARGE consisted of about 200 poker players, a small audience, but clearly an influential one. I seized the opportunity. I didn't attend the entire event, but the organizers gave me a chance to speak a few times (I was giving away nice PokerStars swag). What I saw during the BARGE Main Event convinced me that I had to attend the next year. There was a surprising number of well-known poker players who were part of this group. I recall seeing Andy Bloch, Chris "Jesus" Ferguson, Russ Rosenblum (fresh from his WSOP Main Event final table appearance that year), a few members of a group of crazy gamblers called the TiltBoys and other recognizable faces. As I watched these guys and the rest of the community play, I realized that I was watching world-class players playing a $100 event with just as much intensity as they played in the WSOP. Shortly after the Main Event started, I heard some applause start, and eventually it became cheers and loud applause. I asked someone what that was about, and he told me that someone had just busted out. A BARGE tradition is to applaud players as they bust out, and it's done in an almost entirely sincere and respectful way. The first bustout seems to get substantially more applause, ostensibly because the rest of the group is relieved not to be out first. As I walked around the tables, I noticed that many players had one or more trinkets on the table, and I'm not talking about card cappers. There were stuffed animals, CDs, DVDs, pieces of jewelry, shot glasses, goofy Las Vegas tourist items - and no common thread. I couldn't figure out what this was all about, so I asked, and learned about another BARGE tradition. "Those are bustout gifts," another BARGEr patiently explained to me. "When a player busts out of the Main Event, he or she gives the bustout gift they've brought to the person who busted them." I found this charming, and oddly moving. It showed respect for the game and the other players, something sorely lacking in the games I was used to. BARGE is held at Binion's in downtown Las Vegas. It's been moved around a few times, mostly because of the problems Binion's had in the mid-2000s, but it's been at Binion's consistently since 2007. 2003 was my first year as a real member of the BARGE community. The 'formal' part of BARGE consisted of a handful of tournaments, mostly games I knew - there was a Tournament of Champions format event (limit stud, limit hold 'em, limit Omaha High/Low), a California Lowball event, a video poker tournament, a few others that I don't recall and a No Limit Hold 'em "Main Event." None of the tournaments had buy-ins higher than $100; if I recall correctly, my total outlay for all of the tournaments I played was about $300. You can play any of the three flops. 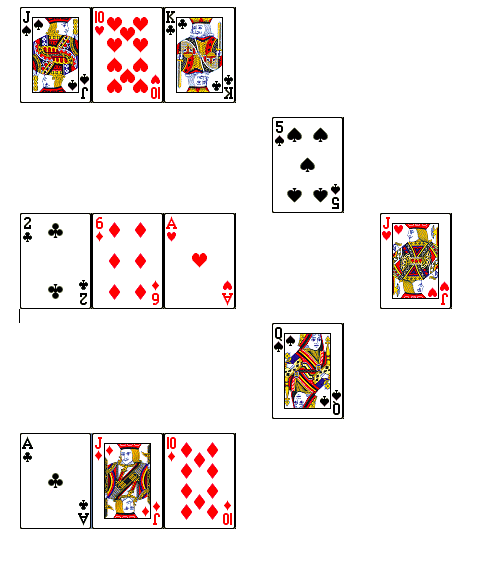 If you play the top flop, you can play the top turn card; if you play the bottom flop, you can play the bottom turn card. If you play the middle flop, you can choose from either turn card, and in any case you use the single river card. Over the years, many additional strange games have been added to the mix, some with obvious names (Second Best Hold 'em), some with entirely inscrutable names (Scrotum, which is played either N or N-2, Oklahoma). I was even involved in the creation of one of these games - Binglaha, which is Pot Limit Omaha, but whether you're playing high-only or high-low is determined by a die roll after the flop betting is complete. In addition to the scheduled events, there is a wide range of unofficial, sometimes ad hoc events. There's a midnight $1 craps crawl. There's a breakfast at a classic Las Vegas place called The Egg and I. There's a sushi dinner, and an Ethiopian dinner. There's a Fun Run (although what's fun about running in 100 degree Las Vegas heat is beyond me). There's a cigar smoking/bourbon tasting event. And new things spring up all the time, shaped by the varying personalities of the group. And there's a notable appearance of anarchy that I have always found particularly charming. There's no registration desk - you pick up your badge from the desk at the poker room. There are no opening or closing ceremonies. BARGE starts when people arrive, and ends when they leave. It's very well-organized, but the machinery is so well hidden from attendees that it appears to run itself. Since 2003, while Sharon and I have been inconsistent about taking vacations, the one week we always take off is the first week in August. It is, without a doubt, the most fun I have playing poker all year. I can't recommend BARGE highly enough - many of my closest friends have come from this group, and while we may only see one another once a year, it's during a week of a game we love, playing for bragging rights and pure enjoyment. And make sure to come find me. I'll be the bald guy playing Binglaha.